There were several prominent piping figures named ‘James Robertson’ during the first half of the 1900s; this one, James (“Robbie”) Robertson of Banff, a Gordon Highlander, was a prolific composer. (above). 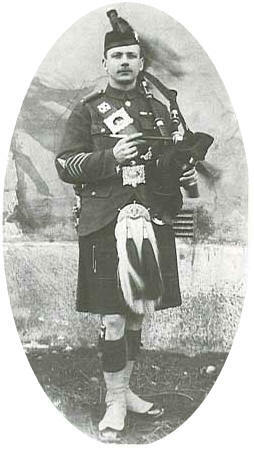 Born in Bannffshire on August 23rd, 1886, he began learning pipes at the age of 15 from P/M William Sutherland of Airdrie. “On August 13th there were eighteen pipers in the Battalion, most of whom had been pupils of G. S., but by 27th August only two had escaped capture or death. Robbie was amongst the former being taken with the majority of the Battalion at Bertry on 27th August, and he was to spend virtually the whole War as a prisoner. He was sent to Sennelager near Paderborn in September 1914 and was court martialled by the Germans on three occasions during his time as a POW for ‘refusing to carry out work of a military nature, i.e. building Zeppelin sheds and, as a Non-Commissioned Officer, inciting men to refuse similar work.” For years afterwards, Robbie, in his inimitable, amusing style, would recount his experiences as a prisoner in charge of liquidizing human excrement prior to its application as a fertilizer on the surrounding German farmland. This typically efficient German approach was frequently sabotaged by the prisoner in charge, which leaves much to the imagination! Indeed, on 17th December, 1915, so difficult had he become to his captors that he was sentenced to one year’s imprisonment. Actually, a large part of this period was spent in solitary confinement and the sentence took one year, ten months to complete. He would not give in. Indeed, such had been his example to others that in February 1920 he was awarded the Meritorious Service Medal in recognition of his valuable services as a prisoner of war." In April of 1918 he was exchanged as a prisoner and the next year he rejoined the 1st Battalion in Limerick where he composed his most famous of many compositions, Farewell to the Creeks.